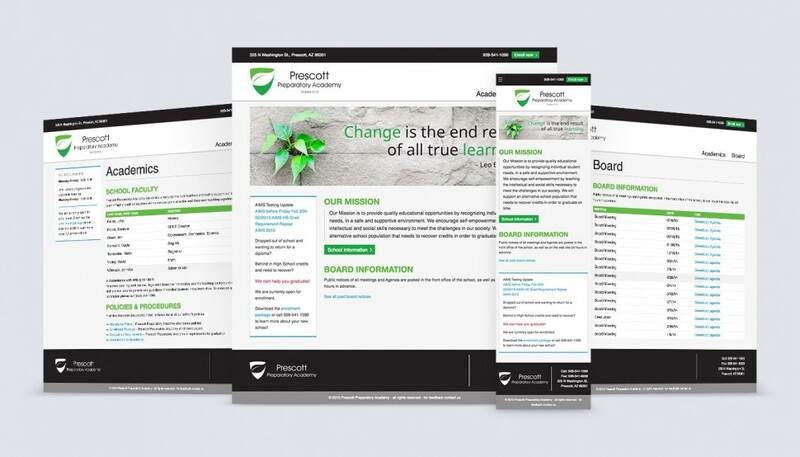 Create a new logo and website to provide a portal of information for a charter school in Prescott, AZ. The EdOptions Foundation runs several charter schools through the state of Arizona. Prescott Preparatory Academy was the latest acquisition and they were in need of a new logo and website to post academic schedules, board information and enrollment documents. The existing foundation logo was a simple leaf shape with a duo-tone green scheme. Since the client wanted to keep this new logo in the same family, I knew I was going to keep the same font and some sort of leaf. I also wanted to address the preparatory academy aspect of the new charter school, which similar schools often used badges, emblems or trees. After playing with it, the badge and leaf fit very naturally together. The website would borrow the same colors as the logo while keeping the modern flat look that the logo and foundation already have. Since the client’s goal for the site was so simple, creating the site for their needs was a very easy process. The final site is a simple to navigate, responsive site built into a custom WordPress theme. This way, it is accessible by anyone, anywhere and very easy for the client to update schedules or documents without the need of a web designer.